Click on the images below for larger photos. North Atlanta home looking its finest at nightfall. This house features standard up lighting at the base of the house but there are numerous mini lights that are in the corners of the gables. This house features mostly up lights but there are up lights on the crepe myrtles in the front yard as well as path lights in the foreground (flanking the driveway). Installation in Johns Creek, GA.
8 ground-based brass spot/up lights. 7 roof and gable based brass mini spot lights. Post lights are an extremely effective way to light decks and stairs. They are very popular and allow homeowners to enjoy their outdoors without having to turn on flood lights that are too bright and create uncomfortable glare. This home is lit with up lights placed 12″ from the house spaced evenly between the windows. The top center gable is lit by two mini inset spot lights. Left and right trees are lit to frame the house. Path lights are on the front walkway for safety and beauty. This house features up lights on the front facade as well as mini lights mounted on a gutter to illuminate the large gable. Up light are on trees in the foreground and path lights are added as well. Country Club monument sign illuminated by wash/flood light. Crepe myrtles are lit by up/spot lights. This homeowner changed his warm-white bulbs with alternating red and blue bulbs for a festive look for their July 4th party. We also light restaurants. This restaurant is ringed with our warm-white C-9 holiday lights. This Suwanee restaurant draws extra attention from drivers on busy Peachtree Industrial Boulevard. This house features up lights on the columns and lower garage. The second story is lit with up lights mounted to the standing seam roof. The garage gable is blocked by the horizontal soffit so mini spot lights were installed in the corners. The top center gable is lit with mini spots in the corners. We do residential Christmas lights too. This house features warm-white C-9 lights. Thank you for visiting our Landscape Lighting Design Gallery. We strive to help our clients add beauty, utilization, and a visual impact to their properties, both interior and exterior, as well as provide energy, safety and security solutions through the use of light. We will always work around your schedule to get your lighting installed as quickly and as efficiently as possible. Our expertise is free. 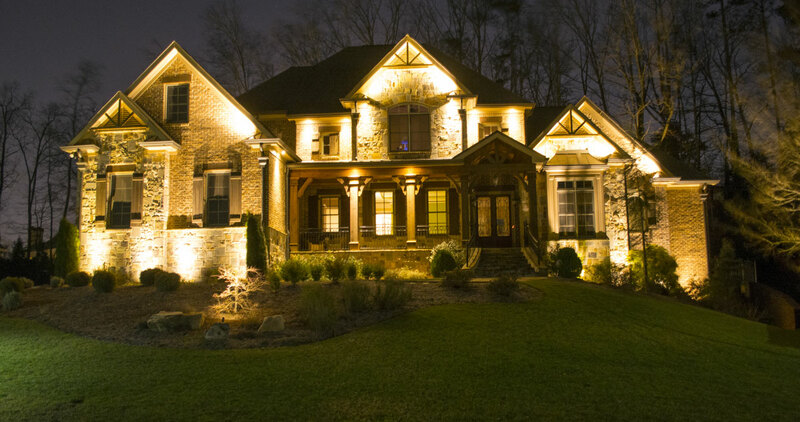 If you see anything that you like in this Landscape Lighting Design Gallery or if you’d like for us to come visit for a no-obligation consultation we’ll be happy to meet with you.